Bottles are loaded automatically from inbuilt slat conveyor and unloaded after rinsing automatically at the out feed end of conveyor. For rinsing, the bottles are picked up by gripping heads, which are supported by carousel that by turning makes the grip level arms slide on a fixed helical guide. In this way bottles are turned upside down to have the openings at the bottom to coincide with spray nozzle. After rinsing, bottles are again turned back to up right position during the rotary motion and carried over to out feed conveyor. Both outside and inside of surface can be rinsed and single or twin cycle rinsing can be incorporated in the machine. 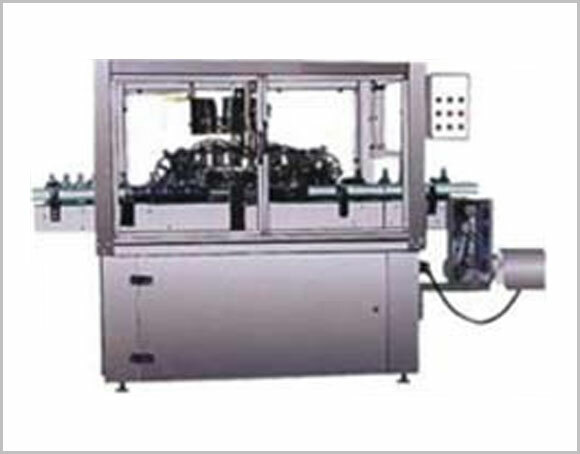 Also Machine can be used either for rinsing with water or airjet cleaning as per the specific cleaning requirements. This is ideal machine for rinsing speeds of 40 – 240 BPM and can be used for GLASS/PET/PVC etc. BOTTLES of different shapes and sizes with additional Change Parts.